Marson is a well trusted name for body filler in the auto body and collision industry. If you want quality and affordability all in one easy to use package then Marson body filler is the perfect body filler for you. There are many different Marson body filler products to choose from depending on the current task at hand. Some of the quality Marson body fillers that are popular among DIY car enthusiasts and body repair shops alike are the Marson Mar-Glass fiberglass reinforced filler, Marson Platinum body filler, Marson spot and glazing putty, Marson platinum glaze and Marson Marglass Fiberglass bondo. The unique properties the full line of Marson body filler ensure that one or all of these products are an essential for any auto body repair shop. If you are looking for Marson body filler that is strong and durable then Mar-Glass is a great choice. This reinforced fiberglass filler was created to be waterproof and provide double the strength of your average body filler. This specialty Marson body filler is created with metallic flakes to create a metal like finish that is both waterproof and resistant to rust. Marson Platinum body filler is a stain free, tack free body filler that is lightweight then this is the body filler for you. Marson Platinum provides the best adhesion qualities when working with aluminum, E-coat, galvanized steel or SMC. The creamy and smooth texture of this top of the line body filler make it quick and easy to apply and also decrease the amount of sanding time needed to create that smooth finish that you are after. So if you want a lightweight body filler that goes on easy and sands easy too then check out Marson Platinum body filler. So if you want professional body filler that is strong, durable and waterproof then look no further than Marson body filler. Marson offers another great product as well; the Mar-Glass Stuff-it which is polyester based filler which is reinforced with fiberglass for added strength and durability. Not only is this quality Marson body filler strong and durable, you will also love the waterproof qualities which ensure all repairs are waterproof and resistant to rust and corrosion. Marson body fillers are a great choice for any serious car enthusiast such as those who work in auto body repair and collision shops. One of the best things about Hutchins sanders is that they are all American made unlike many other popular brands of hand and power sanders. Hutchins is an innovative company which takes sanding technology seriously. Hutchins has been family owned and operated since 1955 and is committed to providing the best quality tools and additional accessories for surface preparation. Hutchins sanders are created by experts in the field and all of their sanders and accessories are thoroughly researched and developed to meet the needs of those in the industry. There are many types of Hutchins sanders available such as the straight-line sander, water sander, orbital sander, vacuum assist sanders and hand sanders. Hutchins sanders are constantly evolving and changing because Hutchins Mfg. Company is committed to keeping up with the newest industry standards and demands. All Hutchins sanders are consistently redesigned to adjust for the latest performance advancements to provide you with the best product, the best performance at the best price. One of the best things about Hutchins sanders is that they offer a no strings attached rebuild program which allows you to keep sanding for much longer than if you had went with a less expensive important sander. While it may cost you a little more to purchase a quality Hutchins sander at first, in the long run your investment in a quality sander will save you money in the long run. When you add up the cost of multiple cheap imported hand sanders, you can see how an investment in a Hutchins sander is a wise choice. So, make the most of your money and invest in a quality Hutchins sander. There are many different Hutchins sanders to choose from that provide exceptional hand sanding. The Hutchins hand sander sanding block for Velcro Hookit, Hutchins hand sanding block for Stikit or PSA sand paper, Hutchins hand sanding block/board for PSA or clip on, Hutchins hand sanding board for clip on of PSA, Hutchins hand sanding block for PSA or non-stick sandpaper and Hutchins hand sanding board for dry sanding. Each of these top of the line Hutchins sanders are built to last and designed to work with your favorite brand of sandpaper. If you need to scuff a factory fender or perhaps you are working with an aftermarket fender so that you can get prep to prime, seal or paint then 3M scuff pads are the perfect choice. If you want the most loved scuff pads in the industry then you will be glad to know that 3M scuff pads are our best-selling scuff pads for those who work in the auto collision industry. This is because 3M scuff pads offer the best value because they are strong and durable and therefore will last much longer than many other less expensive brands. 3M scuff pads are designed to be used for a variety of different uses and are thought to be the most versatile scuff pads around. If you need to scuff a fender, scuff or strip a rivet on a tractor trailer or airplane then 3M scuff pads will get the job done for you with ease. The best thing about 3M scuff pads is that they come in many sizes and shapes so you can be sure that there is the perfect 3M scuff pad for all of your auto and non-auto uses. Not only are 3M scuff pads great for auto body work, they are also useful around the house as well for things such as removing slight imperfections in the surface of stainless steel too. 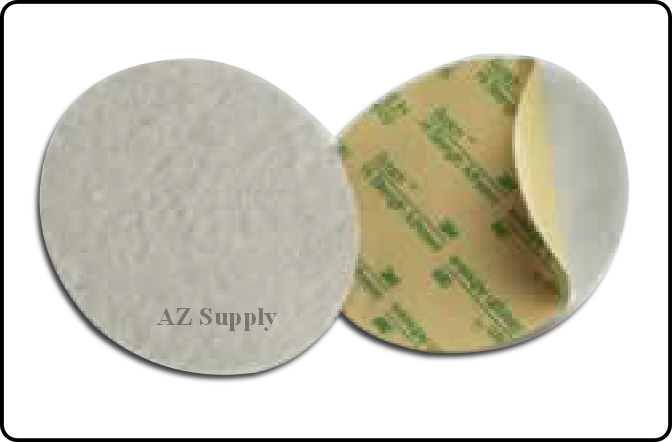 You can choose a variety of different 3M scuff pads such as the 6” x 9” scuff pads which come in a box of 20, the Scotch rite clean and strip discs in black (Also referred to as the cookie), Scotch Brite cuff rolls which measure ¾” x 15’, Scotch Brite surface conditioning discs which come in 3 in 1 or 4 in one varieties, rivet cleaning disc, bristle discs which come in 3” and 2”, Roloc gasket removal discs, general purpose scuffing wheel, 8” x 20” sheet rolls and 3” bristle discs. So, if you want the perfect 3M scuff pads for the job you can be sure that they offer the perfect product for your needs. When you work in the auto body & painting business, it is essential that you choose top quality products in order to achieve the clean custom paint finish that you desire. American masking tape made by Intertape is specifically made for the auto aftermarket in order to provide professional auto painters with the ability to increase efficiency and create clean lines. Not only is this line of tape a great way to increase efficiency, it is also affordable too; so, why would you not choose American masking tape? American masking tape is designed to be easy to apply and designed to provide a clean removal when working on either cold or hot auto surfaces. 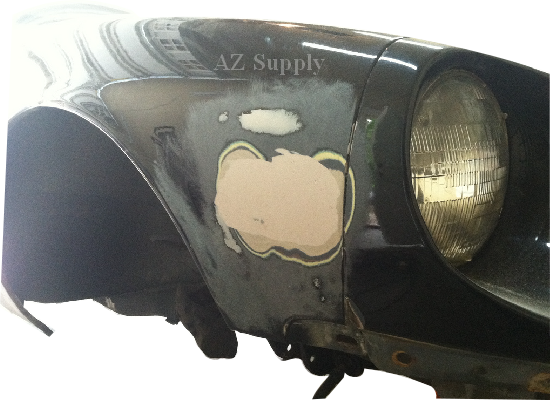 American masking tape is the number one choice of those in the auto body & painting industry because it offers you with the ability to easily perform wet stripping and many other advanced auto painting techniques with ease. American masking tape is UV resistant for up to 72 hours and will never leave behind a sticky adhesive, which ensures a quick and easy clean up. American masking tape takes first place for overall performance due to the fine crepe backing which ensures even break lines for a clean sharp finish. Not only this, the tape conforms easily, is flexible and is solvent and UV resistant. One of the reasons why professional auto painters choose every time is because this professional grade masking tape is perfect for wet sanding. The top notch adhesive backing ensures excellent transfer and is also ear resistant so you can be sure of a clean removal under varying conditions creating the sharp lines and edges you desire. When working with curves, there is no better product then American masking tape to get the job done right the first time around. American masking tape is highly conformable and offers improved elongation for easy handling which makes it perfect for custom paint finishing. This affordable yet powerful masking tape is the top choice with collision repair shops because it will stick quickly and stay put in a variety of conditions. So, if you want the best masking tape for your collision repair shop choose American masking tape; you will not be disappointed. If you want the best body fillers on the market then look no further then Dynatron bondo by 3M. 3M has been creating quality products for many years and their full line of Dynatron bondo is no exception to this rule. If you want the leading bondo in the industry then look no further than Dynatron bondo to fill dents, scrapes, rust holes, sand scratches, chips or cracks. Best yet, Dynatron bondo will never shrink and is very strong and durable making it a great choice for those in the auto body repair industry. Dynatron bondo is very versatile and will work perfectly for a wide range of applications. Not only is it an affordable option for the professional auto body repair finisher, it also cures fast and can be easily shaped within minutes allowing you to use for same day repairs on both big and small jobs. Another wonderful benefit of this 3M bondo that DIY enthusiasts and auto body shop professionals alike enjoy is the fact that Dynatron bondo spreads easily and can be sanded out in only twenty minutes. Dynatron bondo is designed for the auto aftermarket; however, it is also great for use on a wide variety of other materials as well such as all painted surfaces, fiberglass, aluminum, metal, wood, masonry and concrete. If you are searching for a bondo that is water proof and will accept paint as easily as wood then look no further than Dynatron bondo, its waterproof formula that will not shrink and dries quickly is the perfect choice for auto body repairs. 3M makes a variety of different types of bondo products such as Dynatron bondo Ultimate, Ultra Grip two and Dyna-Plus. Each of these products is designed to be used as auto filler and offer unique benefits. Dyna-Plus is a gold colored bondo that is stain free, lightweight and tack free to ensure top notch adhesion to aluminum, galvanized steel, steel and SMC. Dynatron Ultimate is also stain free and tack free and is the best-selling product because it offers the best adhesion to E-coat and SMC. The Dynatron bondo Ultra Grip 2 is lightweight filler that is formulated to offer enhanced adhesion properties for hard to adhere surfaces. 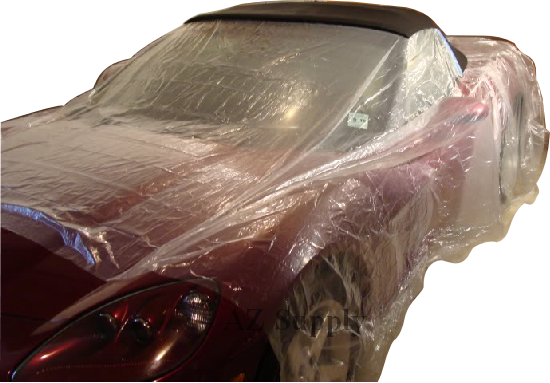 If you work in the auto body industry or plan to create a custom paint finish at home on your car then you will need to invest in a quality plastic masking film. This film is specifically designed for the auto body aftermarket and is designed to help you mask off the car before painting so that it will attract any over spray and prevent it from getting onto any freshly painted surfaces. With plastic masking film you will have less color sanding and buffing which means less time to complete the project and less work as well. There are many different brands of plastic masking film on the market to choose from; however, it is a good idea to do your homework first because not all plastic masking film is the same and some will work better than others for auto painting projects. Some of the most well-known names in the plastic masking film industry are 3m, Fiberglass Evercoat, US Chemical and Five Star just to name a few. Choose wisely because you will get what you pay for. Do not cut corners when it comes to plastic masking film, or you will be disappointed with the results. Plastic masking film comes in a wide variety of sizes such as 12”, 14”, 16” and 20” in width. The different sizes are available to provide you with the overage that you need for all different sizes of vehicles. 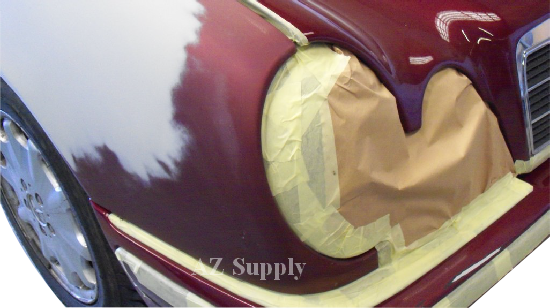 For small compact cars the 12” size is typically plenty large to thoroughly mask off the auto body to ensure that the overspray is thoroughly eliminated or it will lead to more work for you. If you are not sure which size of plastic masking film you need, check the recommendations of the manufacturer to determine the proper size that you need for the job. Choosing a quality plastic masking film will ensure that you receive all of the cling properties that you would expect from plastic masking film without any static electricity. Low quality plastic masking film can sometimes come with static electricity which can attract dust and dirt to the surface of your car. Do not make the mistake of choosing low quality plastic masking film; make sure that you take the time to choose a professional grade plastic masking film to ensure the best results possible. 3M has been in business for more than 110 years and originally launched their success with quality grinding wheel abrasives. Today 3M has grown and expanded to become one of the most well-known and well-loved abrasive companies in the world due to their commitment to quality customer service and their ever expanding line of innovative products such as Hookit sandpaper. Hookit sandpaper is designed to work in conjunction with their quality Hookit system. 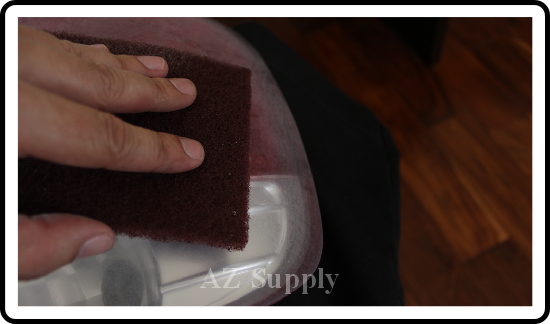 3M Hookit sandpaper can be used with a machine or by hand whichever you prefer. Their full line of 3m Hookit sandpaper and accessories are easily and sufficiently secured with ease due to the convenient Velcro attachment system which 3M refers to as Hookit. 3M Hookit sandpaper is quick and easy to attach due to the easy Velcro attachment system. This will not only save you time, it will save you money too when you choose Hookit sandpaper by 3M because it ensures a quick and easy change of grits to allow you to continue with the job with little to no delay, and to be able to re-use sandpaper until it is used up saving you money and productions time. Another great thing about Hookit sandpaper is that there is no need for glues or adhesives which ensures that you can use each Hookit sandpaper sheet down to the last drop which will save you money over time. This is because the 3M Hookit sandpaper system allows your Hookit sandpaper to run cooler and prevent deterioration of your Hookit sandpaper. On average, Hookit sandpaper lasts about four times longer than other similar competitor products available on the market today.